In a large saucepan, bring cranberries and water to a boil. Reduce heat; simmer for 5 minutes. Meanwhile, using a sharp knife or zester, peel outer layer of one tangerine into strips for garnish. Toss the strips of peel with 2 tablespoons sugar; set aside. Squeeze tangerines to yield 1 cup of juice. Place cranberries with liquid in a sieve over a large bowl. Press berries to remove juices. Discard pulp. Add the tangerine juice, corn syrup and remaining sugar to cranberry juice; stir until sugar is dissolved. Pour into a 9-in. square dish. Cover and freeze until firm, about 3 hours. Remove from the freezer 30 minutes before serving. Spoon into dessert bowls. Garnish with reserved tangerine peel. 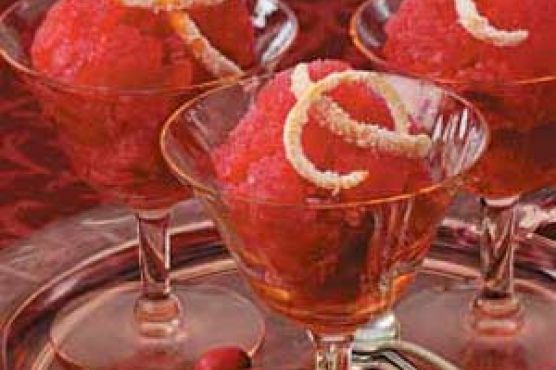 Frozen Dessert can be paired with Cream Sherry, Moscato d'Asti, and Port. A common wine pairing rule is to make sure your wine is sweeter than your food. Delicate desserts go well with Moscato d'Asti, nutty desserts with cream sherry, and caramel or chocolate desserts pair well with port.